A dental crown is a single cap that is cemented over a single tooth to provide protection when that tooth has become decayed or damaged. A dental bridge is a series of crowns that are used to “bridge” the gap between teeth when one or more teeth is missing. Both crowns and bridges serve as valuable dental prosthesis that can restore the aesthetics and function of your smile. Dental crowns can fix a number of dental issues including replacing large fillings, protecting a weak tooth, restoring a fractured tooth, covering a discolored tooth, attaching a dental bridge, or covering a tooth after a root canal. A dental crown may be right for you if you have a single tooth that is intact, but partially damaged or decayed. A dental bridge may be right for you if you have a missing tooth, but the space is surrounded by other teeth. To find out for sure if a dental crown or bridge is the right option for you, schedule a consultation with Legacy Dental today. Are there different types of dental crowns? Stainless Steel: These crowns are used primarily as a temporary crown or for children because they are highly affordable and only require a single office visit. Stainless steel crowns are usually used to protect a child’s primary teeth from decay, and are meant to be lost once the primary tooth is lost. Metal: Metal crowns are highly durable and are the longest-lasting dental crown, however they are not as visually appealing due to their metallic color. 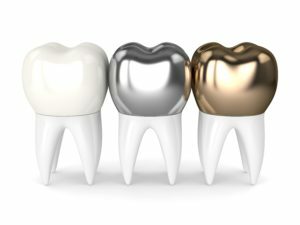 Metal crowns can be fabricated from gold, platinum, or base-metal alloys such as cobalt-chromium or nickel-chromium. Porcelain Fused to Metal: These crowns use a metal crown with a porcelain coating. The porcelain is matched to the surrounding teeth and maintains a natural appearance with the durability of a metal crown. However, sometimes the metal can be seen through the porcelain. 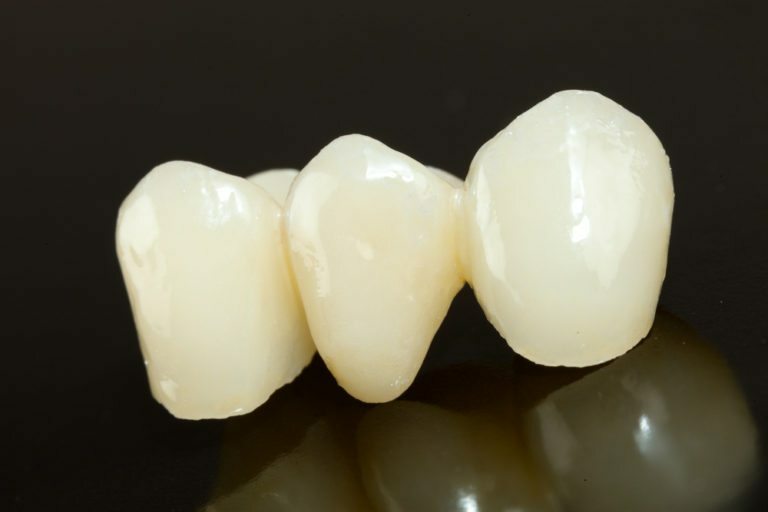 This type of crown tends to work best for the front or back teeth, or with long bridges that require strength. All-Resin: These are made from a durable plastic material and are more affordable than other types of crowns. However, they do not last as long and have a higher chance of developing fractures than the other types of crowns. All-Ceramic or All-Porcelain: These are used in individuals with metal allergies, or with those who would like a natural appearance to their dental crown. They can be used for both the front and the back teeth. Temporary: These crowns are worn only for a few weeks maximum while the permanent crown is fabricated by a dental lab. They are usually made of an acrylic-based material or stainless steel. Traditional Bridge: The most common type of bridge which uses a crown on either side of the gap and a pontic, or artificial tooth, in the space left by a missing tooth. Cantilever Bridge: A bridge that is used when there is only teeth on one side of the gap left by missing teeth. These are not commonly used and may not always be recommended because they can exert too much strain on the adjacent teeth. Maryland Bonded Bridges: These are bridges that have a metal framework to support them and are bonded to one side of the gap left by missing teeth. 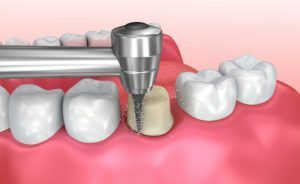 What is the process for placing a dental crown or bridge? To place a dental crown or bridge, your teeth will first be shaped in order to support the crown or bridge. After your teeth have been shaped accordingly, a dental impression will be taken and sent to a dental lab. 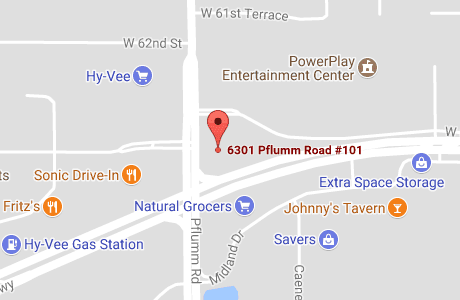 This dental lab will use the impression to fabricate a custom crown or bridge to match your existing teeth and blend with your existing smile. During this fabrication process, you will be given a temporary restoration to wear. After a couple of weeks, the final restoration will be permanently cemented into your mouth and the placement process will be complete. Will I need to recover after having a dental crown or bridge placed? After you have a dental crown or bridge placed, your teeth will experience a brief healing period. During this time, you may notice that they are sensitive to hot or cold temperatures. You may also notice that your gums feel sore. This is all part of the healing process and should return to normal within a few days. Over the counter pain medications can be used during this healing process to keep you comfortable. What special care does my dental crown or bridge require? Dental crowns and bridges do not require any time of additional care beyond your normal dental habits. However, these dental habits should consist of brushing twice daily, flossing once daily, and visiting Legacy Dental semi-annually for your dental checkup and professional teeth cleaning. 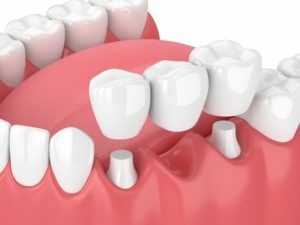 The lifespan of dental crowns and bridges depend on the materials they are made out of, their location in the mouth, and how much wear they endure. To decrease the amount of wear and increase their lifespan, you will want to avoid grinding your teeth, chewing ice, using your teeth as an opener, and biting your nails. How much do dental crowns and bridges cost? Just as the lifespan of dental crowns and bridges depends on a number of factors, the cost also depends on these same factors. However, a general figure is about $800-$1700 per tooth. Most dental insurance companies can also help offset the cost by offering partial coverage for dental crowns or bridges.